It's time for another challenge over at Let's Craft and Create. and the theme is a recipe. All you need to do to enter is use the following on your card or project - new projects please. 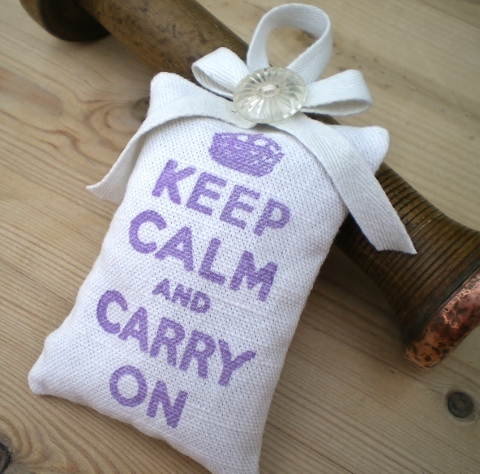 I've made a lavender bag, I stamped the 'Keep Calm' sentiment, onto white fabric using Versacraft ink, and added a twill ribbon bow and vintage button to pretty it up a bit. If I made another I'd add a lace edging for a bit more prettiness! It now sits on my craft bench as a gentle reminder! Would be great to see you join in this time. Check out the Let's Craft and Create Blog for all the details, some fabulous inspiration from the Design Team and the prize up for grabs for one lucky winner. This is so cool! I thought it was cross stitched! It has worked so well. Love your lavender bag Vicky...such a great sentiment, and it looks fab stamped onto fabric. A gorgeous wee bag. So sweet. Sentiment looks great. Fabulous, I need that stamp!